You wanted the best, you got the best! It’s KISS! At the height of their powers in 1977! With all four original members! Performing live in Japan! .. (exclamation points officially ending here) … This was recorded for HBO and I remember seeing this very concert during the summer of 1979 when me and my brother went to visit my Dad in Northern Virginia. Two of my Dad’s female neighbors in their early 20s invited us all over to watch the concert on their TV since they had HBO. I can’t imagine my Dad’s neighbors were particularly interested in KISS … or my brother and me, for that matter … but I’m not going to complain that they used my interest in KISS to get to know my Dad better. It was doubly cool because I was now able to see my favorite band at the time life, I also got to check out this thing called HBO that I had seen advertised on TV, but wouldn’t be available in my neighborhood for two more years. As always, Paul Stanley doesn’t disappoint with his stage raps here. Why is this my favorite Misfits song of all-time? Because I ain’t no goddamn son-of-a-b–h! One of the funniest and most famous prank call tapes of all-time were the series of calls made to the Tube Bar in New Jersey to the bar’s owner, a man known as Red. The caller would ask Red if certain patrons were available at the bar to talk. The names were usually plausible, but ultimately ridiculous names like “Pepi Roni” or “Mike Hunt” (say that last one to yourself a few times quietly, if you’re not sure it’s ridiculous). Sometimes Red would comply, shouting out the ridiculous names into the bar, but other times he would see through the ruse and let loose with some of the funniest profanity ever uttered by a human being. I realize being on the receiving end of telephone harassment isn’t funny, but when you’re not the one receiving it, it can sometimes be pretty f–king hysterical. What’s featured here is the original Tube Bar tape set to visuals crafted by Film Threat editor Christian Gore, starring the late, great Lawrence Tierney as Red. Aside from Joe in “Reservoir Dogs” and his role as Elaine’s dad on “Seinfeld,” this may be Tierney’s finest role. As you can imagine, absolutely not safe for work. One of the byproducts of listening to 70s stations is the appearance of a Harry Chapin song every now and then. Running into a Harry Chapin song is like running into a pastor you try to avoid because they can’t resist giving you a parable … and said parable always makes you feel either terribly depressed or very guilty. Maybe it’s a lapse in taste, maybe I’m a glutton for punishment, or maybe it’s just the fact that Chapin is a great songwriter / storyteller (or all of the above), but I’ve been listening to a lot of Chapin these days. The above song is about an aging DJ who chose a radio career over family and as that part of his life is fading, he finds he doesn’t have a family to fall back on. This could be a metaphor for any career that routinely chews idealistic people up and spits them out … from academia to journalism … and the emptiness that such an endeavor often leads to, admittedly unfairly. Back to Chapin, the man led a very interesting life to say the least. He started out by going to the Air Force Academy … dropped out … became an Oscar-nominated documentary filmmaker .. before turning to music professionally. Unlike a lot of peers in the 1970s, he dove head first into activism (especially for world hunger) and seemed to perform more free concerts than paying gigs … even at the height of his popularity when he could’ve commanded top dollar for every gig he performed. He has been credited as the inspiration for Band Aid, USA for Africa, Live Aid, Farm Aid, and every major benefit concert of the 1980s. The man was the definition of the word mensch and he left the world too soon in 1981 when he was killed in a car accident on the L.I.E. If you want to know more, you’re encouraged to check out the terrific VH1 documentary below. One of the more interesting things Chapin did (not mentioned in the documentary) is that when he signed his recording contract with Elektra Records (despite a much bigger offer from Columbia Records), he only took a small advance in exchange for free recording time throughout the entire time of his contract. This was incredibly shrewd, because most artists who record for major labels find themselves in massive debt when the label charges back astronomical costs for recording time that are never recouped … so much so that no matter how many records the artist sells, they are always in debt to the label. The first three songs from side 2 of Roxy Music’s incredible 1974 album “Country Life,” my favorite album from that legendary band. And with a graphic that is finally safe for work! Anyone familiar with the “Country Life” album will know why this is significant. In some ways, “Country Life” is the perfect “desert island disc,” not only for the great music, but … well … the cover. If you’re alone on a deserted island with no companionship and limited media, this album has what I will call “multiple purposes.” If you have no idea what I mean, you can do a search on Google Images. After that, you’re on your own. Oh … hell yeah! From Boston … here’s the Downbeat 5 doing a wonderful slammin’ cover of the Shangri-Las’ “Dum Dum Ditty.” Bang your head and smile. From the 1983-1984 Cinemax-era in SCTV’s history comes their brilliant parody of the infamous Rolling Stones documentary “Gimme Shelter” … reimagined as a vehicle for Martin Short’s brilliantly obnoxious albino lounge singer Jackie Rogers Jr. called (what else?) “Gimme Jackie.” Only instead of the Hells Angels wreaking murderous havoc on the crowd, Jackie hires the Shriners … who prove to be an all-too-formidable and frightening security force. Watch closely and you’ll see many striking similarities between Short’s Rogers character and Mike Myers’ Austin Powers character that appeared over 10 years later. This is a great example of why SCTV was … and still is … one of the most brilliant concepts in the history of world comedy. This was humor for very culturally savvy folks and you either got it immediately or you needed to do your homework. Brilliantly funny stuff. As a bonus, the first minute and a half features Dave Thomas’s spot-on Mel Gibson impression … when Gibson was still more of a cult actor in Canada and the United States. 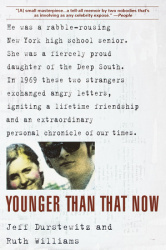 “Younger Than That Now” is a dual memoir by two friends (one from Long Island, the other from Mississippi) who met as teenagers during the late-1960s and carried on a remarkable friendship over 30-plus years, mainly through the lost art of letter writing. I won’t go into detail about how these two very different people became friends, or what they experienced during the period detailed in this book, because the less you know about what happens, the better your experience will be reading “Younger.” (Some well-known people have prominent supporting roles.) What I will say is that the book is a very moving chronicle of how two thoughtful people lived and grew during one of the most tumultuous periods of American history. I remember hearing about “Younger” when it came out in 2000, but didn’t get around to reading it until recently. I’m glad that I waited, because I’m now only a few years younger than the authors when they wrote this book. I haven’t experienced the same level of ups and downs Durstewitz and Williams have in their lives, but I’ve lived long enough to appreciate the complicated journey from adolescence to middle-age portrayed here. Despite how certain many of us were when we were younger about how things are supposed to work, real life has a funny way of setting us straight. Most people I know who are my age or older have lived lives that have not traveled in straight lines. We’ve experienced ups, downs, curveballs, and detours along the way. If there’s one thing that was more valued by the 1960s generation than by Generation X, Y an everything afterwards, it’s the virtue of having what I call “scar tissue,” meaning the wisdom gained from falling on your face, making mistakes, or receiving what life throws at you despite your best planning. If you’re middle-aged, you know exactly what I’m talking about, though it’s sometimes hard to see in the way that many people in my generation portray themselves in social media … going from “win” to “win” every day. I’m glad that Durstewitz and Williams were as painfully honest about their lives as they were, because it helped me appreciate the complicated path that’s been my life. My life hasn’t always been “fun,” but it hasn’t been boring. And the things that I value in my life mean a lot to me more because of the bumps in the road I encountered, not in spite of it.